Today my husband was cleaning out some very old files and came across these S & H Green Stamps. He showed them to me, and it sent both of us on a short trip down Memory Lane. If you were the right age, you probably thought it was great fun to stick them in the books. You’re mom was probably happy to have you do it too. I’m old enough to remember using them, and pasting the sheets onto a form maybe? to redeem them. I also remember a silly Brady Bunch episode where the kids fought over buying something with them. Very cool memory! Sometimes the strangest little things trigger great memories. Thanks for sharing, Terri. Oh that is so incredible. Just last week while watching a lady in check out at the World Market, fussing with the cashier about her smart phone online coupons, the two of them handing the phone back and forth….my husband queries me ? “Remember S& H Greenstamps. Which sent us both off on all the details we could recall. I am laughing to find this post! So cool. I agree. Definitely cool. Glad to have triggered a good memory for you and your husband. Thanks for telling us about it. I haven’t thought of them in forever! Bob was cleaning out an old file drawer, and there they were. He brought them to me so I could take the picture and share with you. 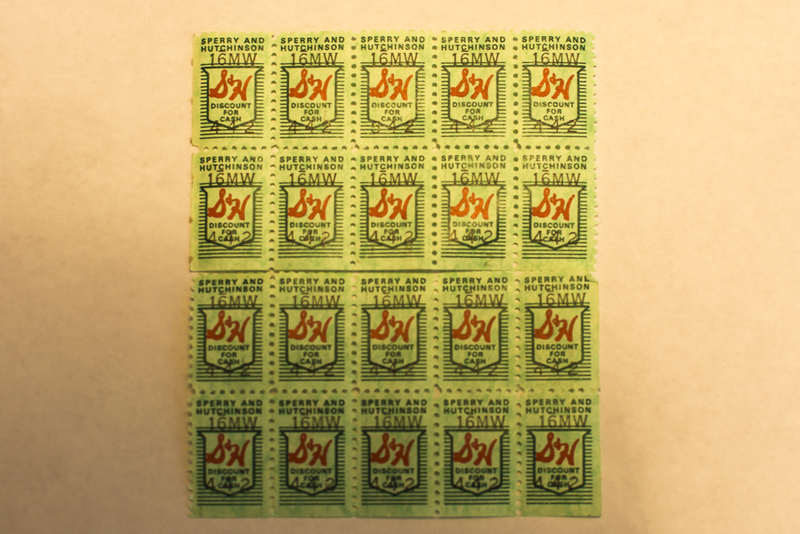 Oh yes, I remember Green Shield stamps in the UK. Then there were coupons that you got with each pack of cigarettes – my grandparents were chain smokers and collected many things with Kensitas coupons. That’s what I call a collateral benefit.The stamps/coupons were probably better than the nicotine.